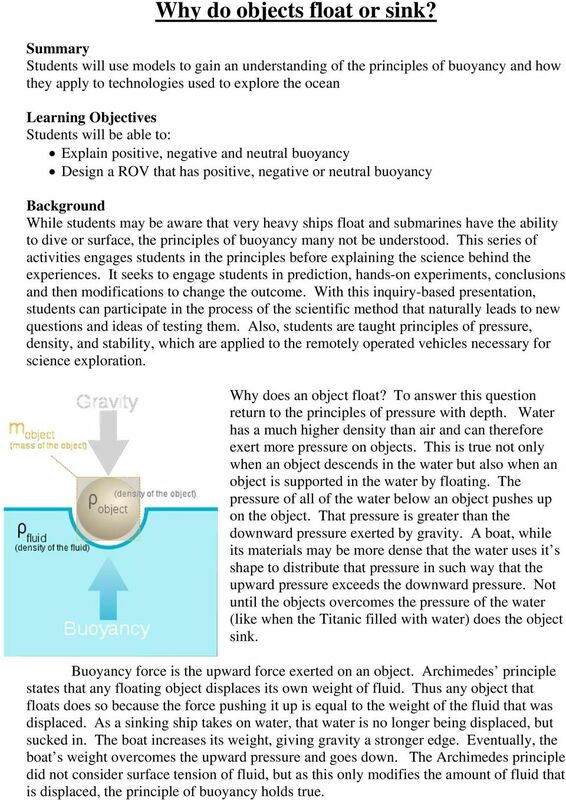 Download "Why do objects float or sink?" 1 Why do objects float or sink? Summary Students will use models to gain an understanding of the principles of buoyancy and how they apply to technologies used to explore the ocean Learning Objectives Students will be able to: Explain positive, negative and neutral buoyancy Design a ROV that has positive, negative or neutral buoyancy Background While students may be aware that very heavy ships float and submarines have the ability to dive or surface, the principles of buoyancy many not be understood. This series of activities engages students in the principles before explaining the science behind the experiences. It seeks to engage students in prediction, hands-on experiments, conclusions and then modifications to change the outcome. With this inquiry-based presentation, students can participate in the process of the scientific method that naturally leads to new questions and ideas of testing them. Also, students are taught principles of pressure, density, and stability, which are applied to the remotely operated vehicles necessary for science exploration. Why does an object float? To answer this question return to the principles of pressure with depth. Water has a much higher density than air and can therefore exert more pressure on objects. This is true not only when an object descends in the water but also when an object is supported in the water by floating. The pressure of all of the water below an object pushes up on the object. That pressure is greater than the downward pressure exerted by gravity. A boat, while its materials may be more dense that the water uses it s shape to distribute that pressure in such way that the upward pressure exceeds the downward pressure. Not until the objects overcomes the pressure of the water (like when the Titanic filled with water) does the object sink. Buoyancy force is the upward force exerted on an object. Archimedes principle states that any floating object displaces its own weight of fluid. Thus any object that floats does so because the force pushing it up is equal to the weight of the fluid that was displaced. As a sinking ship takes on water, that water is no longer being displaced, but sucked in. The boat increases its weight, giving gravity a stronger edge. Eventually, the boat s weight overcomes the upward pressure and goes down. The Archimedes principle did not consider surface tension of fluid, but as this only modifies the amount of fluid that is displaced, the principle of buoyancy holds true. 4 put it in the water and record their observations in row Have the students add the last 2 floats (you may have to double up on some pipes), put it in the water and record their observations in row 6. 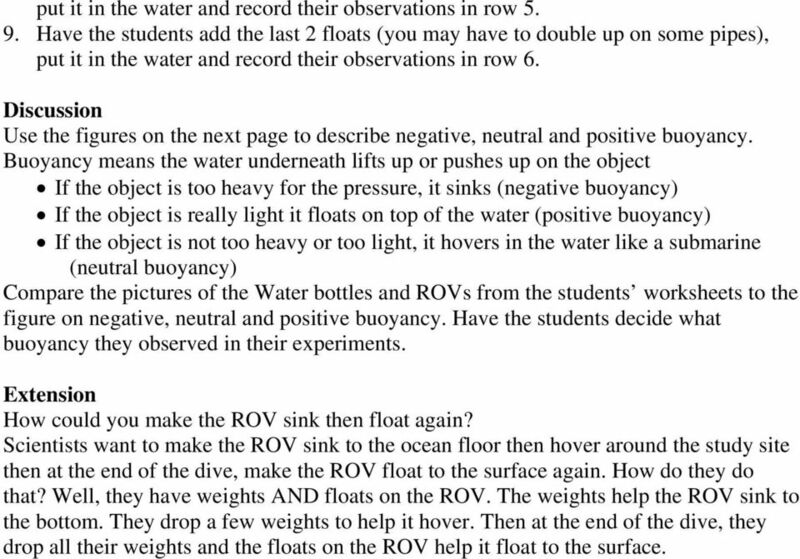 Discussion Use the figures on the next page to describe negative, neutral and positive buoyancy. 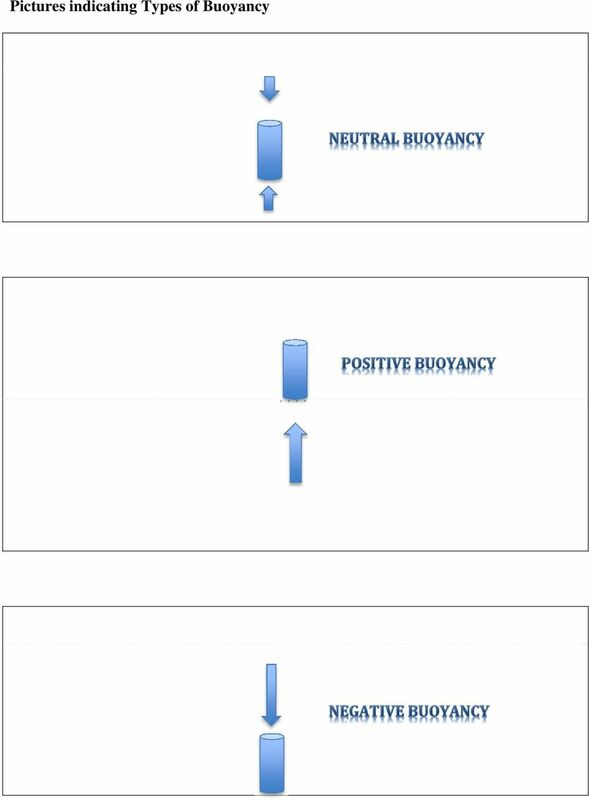 Buoyancy means the water underneath lifts up or pushes up on the object If the object is too heavy for the pressure, it sinks (negative buoyancy) If the object is really light it floats on top of the water (positive buoyancy) If the object is not too heavy or too light, it hovers in the water like a submarine (neutral buoyancy) Compare the pictures of the Water bottles and ROVs from the students worksheets to the figure on negative, neutral and positive buoyancy. Have the students decide what buoyancy they observed in their experiments. 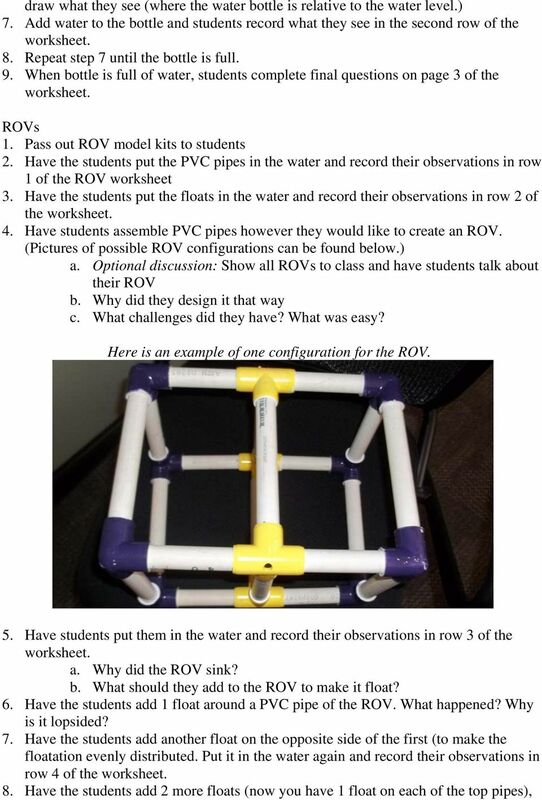 Extension How could you make the ROV sink then float again? 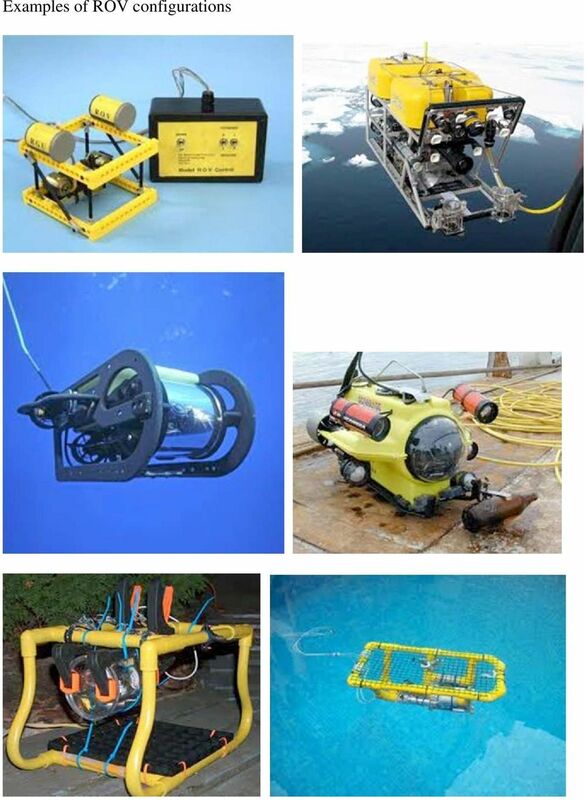 Scientists want to make the ROV sink to the ocean floor then hover around the study site then at the end of the dive, make the ROV float to the surface again. How do they do that? Well, they have weights AND floats on the ROV. The weights help the ROV sink to the bottom. They drop a few weights to help it hover. Then at the end of the dive, they drop all their weights and the floats on the ROV help it float to the surface. Physics of Boats Unit. Unit Description: Through scientific inquiry students learn the physical principals needed in order to build a boat. 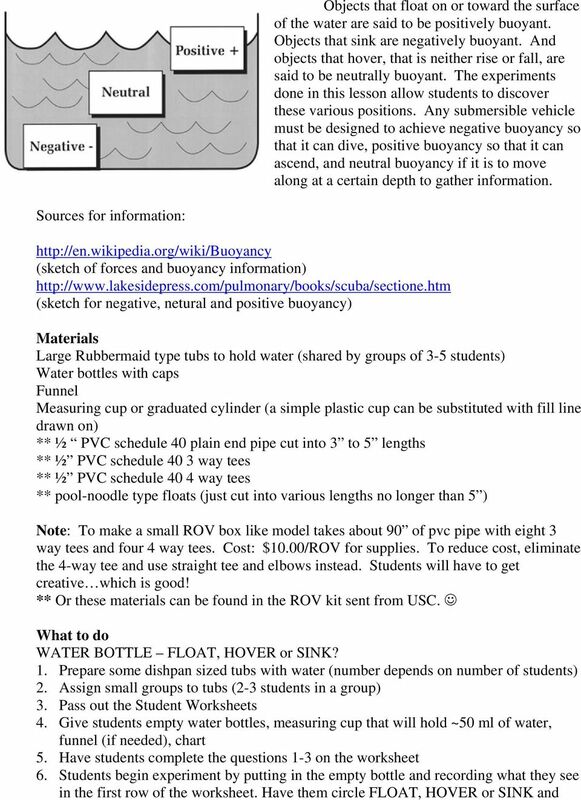 PHYS 1405 Conceptual Physics I Laboratory # 8 Density and Buoyancy. Investigation: How can we identify a substance by figuring out its density? Big Science Idea. Forces. Name. When you ride a bike, your foot pushes against the pedal. The push makes the wheels of the bike move.